This exquisite gem not only has a pretty name but is a relatively unexplored stretch of sand because of its isolation. It’s located on Butterfly Island and is a great place if you’re looking for total privacy. 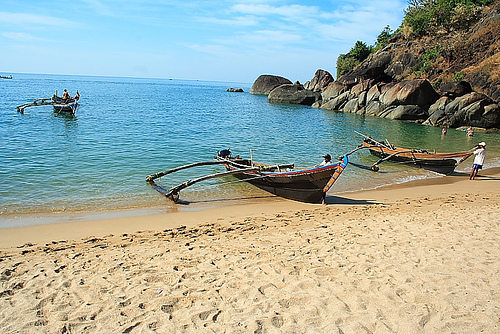 The only way to reach Butterfly Island’s beautiful beach is by boat from Agonda or Palolem beach. If you’re really up for an adventure try getting to this little-known beach, also known as Tiger beach. Located in a bay, its breathtaking beauty makes up for almost getting lost on the way there. The sands are clean and deserted. The only way by land is to take the NH66 highway towards Cola village. Turn north-east and drive on a broken old road which will lead you to a small platform. Take the narrow steep winding stone stairs leading down to the beach. A much easier way to get there is by renting a boat to transport you there and back. Just like the increasingly popular Morjim beach, Galjibag is also a seasonal nesting and hatching site for the endangered Olive Ridley turtle. But unlike Morjim, this beach is deserted except for a handful of shacks that sell cheap, delicious seafood. Galjibag is 18kms from Canacona, south of Talpona river estuary. This serene beach has a lovely bay with a long stretch of shallow water running into the sea that is perfect for non-swimmers and waders. The beach is rocky but the picturesque bay makes up for it. You’ll even see fishermen’s boats lining the narrow, curving shore to create a quaint picture. 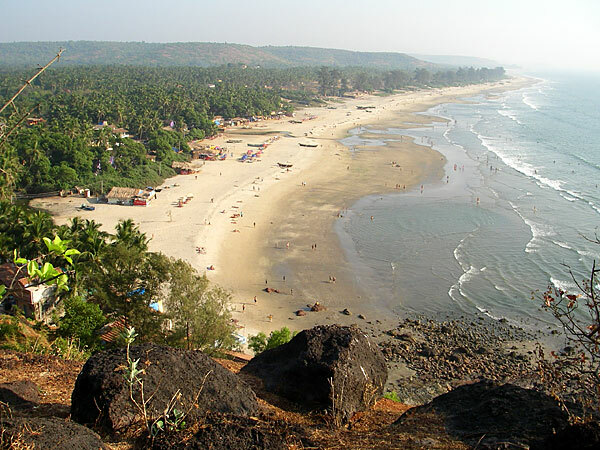 The wide expanse of this compact sandy beach can be found about 18kms from Margao. The scenery will remind you of traditional coastal fishing villages. It even has a small lagoon and a 17th century fort nearby. Get to Mobor beach by land and then take the Cavelossim-Assolna ferry across the River Sal to the beach. This beautiful place in Pernem is another quiet beach where you can have lively Barbeque evenings with friends and family, if you’re so inclined, while enjoying the views of the cliffs bordering the beach on both sides. The area is slowly gaining in popularity, attracting a more bohemian crowd to its shorelines. Cafes and restaurants have popped up close to the beach so you’ll be able to enjoy a chilled beer after a swim. This is a fabulous place for a beach picnic under a beach umbrella. The rocky crag on the southern tip of the beach against an azure sky lends a bit of drama to the serene landscape. Go looking for the bats nesting in trees that line the shore. You can’t miss their black capes and orange-brown faces. It’s located about 37kms from Margao. Even locals, who don’t live nearby, have never heard of this beach before. To get to this hidden treasure travel south to Canacona and then look around for the signs that will lead you to an immaculately spotless beach pictured against a flawless backdrop of coconut groves and blue skies. It’s only five minutes away from Agonda beach and has a unique lagoon surrounded by beach huts where you can stay overnight. Just north of the popular Majorda and Colva beaches in the southern part of Goa is this stunning beach with soft, silvery sand and nothing but a lifeguard and some birds to keep you company. You’ll spot a few swimmers here but like you they’re there to escape the crowds of more popular beaches nearby. This is a pristine stretch of alluring white sand close to Fort Aguada. It’s relatively quiet despite the luxury resorts in the background. It’s a great spot to sit in peace while enjoying the colours of the setting sun light up the sky over the Arabian sea. About 12kms south of Panjim near the Zuari river estuary is this beach with scattered blocks of rock in between smooth strips of sand giving the beachscape an unusually rugged appearance. Another unique quality about this beach is the fragments of oyster shells that wash up on the shore and brighten up the beach. The Chapel of Jesus of Nazareth is the nearest landmark. Siridao also has a few caves nearby that you can explore.